America is probably the best place on Earth for long road trips. Fuel is cheap, food is plentiful, and the roads — they're amazing. But the U.S. of A. wasn't always a land of long, smooth stretches of tarmac you could sail across at 80 mph in almost any weather. A century ago, driving cross-country in America wasn't much better than rallying a Conestoga wagon train. Armed with 81 vehicles and 300 men, the U.S. Army's Motor Transport Corps was just the outfit to give the first big, organized trans-continental motor convoys a go. In 1919, they formed a "truck train" complete with wreckers and service vehicles, and followed the Lincoln Highway — a course which US 30 and I-80 roughly follow today — westward. The reason for such an undertaking was to show the need for better roads. Here's how they did it. America's two coasts had joined together by rail for the first time in 1867. But it took a while for America's roads to catch up and become what they are today. Like the first cross-country road trips in cars, the Army's truck convoy was a grand adventure. We take for granted the seamless ribbons of concrete and asphalt that give us the ability to drive over topographic and geological features as if they don't even exist. Back in 1919, the Lincoln highway was only six years old and those features were very real for the cadre of largely untrained soldiers tasked with driving across unforgiving terrain in rudimentary World War I-surplus trucks. It took the convoy nearly two months to crawl across the 3,000 miles from Washington, D.C. to San Francisco, harried as the men were by 230 "incidents." Back then, and incident covered everything from breakdowns and flat tires to repairing bridges and pulling trucks from the mudholes which were inevitably part of the highway at the time. But the convoy was prepared. In addition to tire repair trucks, the convoy had a couple of rolling machine shops, a rolling blacksmith shop, and a rolling medical clinic. To get at the origins of the 1919 Transcontinental Motor Convoy, we have to turn back the clock a few years, to the 1870s. That's when the bicycle craze hit America, and at the time paved roads were hard to find outside of cities. That made cycling a challenge. Thus was born the Good Roads Movement. As attention shifted from two-wheeled pedal power to four-wheeled gassers, people's range outside cities broadened, and paved roads became even more of a necessity. By the early 20th century, the majority of rural roads were still dusty in the summertime, transforming into muddy, rutted tracks in winter. They were utter misery and something had to be done. Politics played heavily into highway development, and it took continuous lobbying by groups like the Lincoln Highway Association to see the dream of coast to coast auto travel realized. 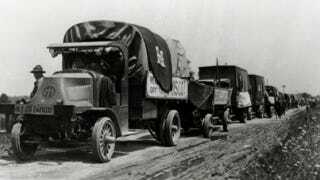 The Lincoln Highway was finally dedicated in 1913 — and others, such as the Maine-to-Florida Dixie Highway, were soon to follow — but as the Motor Transport Corps convoy showed, the roadway still needed a lot of work. The 1919 expedition was led by Henry Ostermann, then Secretary of the Lincoln Highway Association and a fervent motoring aficionado. He had made the same trek with a film crew in a Stutz touring car in 1915, but this time, he was to begin the journey at the head of a column of military trucks, driving a Packard twin-six touring car. The convoy got underway on July 8, 1919 as any good military operation does, with a parade. Ostermann led the procession, his Packard plastered with Lincoln Highway signs. The train of trucks, motorcycles and tenders followed, filing past the White House and into history. Ostermann may have been in it to advance civilian motor travel, but according to the Illinois Department of Transportation the Army's mission was to test the feasibility of moving men and materiel over long distances by car and truck. The Lincoln Highway actually began in New York City, so the convoy picked it up at Gettysburg, Pa., where the source of the highway's name — President Abraham Lincoln — delivered his most famous speech in 1863. From Pennsylvania to Illinois, to road was mostly paved, but west of Lincoln's home state, the convoy had conditions that got a bit more rustic. Driving through dusty and/or muddy conditions most of the rest of the way, the convoy averaged 15 mph during its 10-plus hour travel days. Where it stopped, the convoy attracted crowds of curious onlookers. Although most of the men assigned to the unit were raw recruits, World War I had just finished, so people wanted a look at the machines that had served in Europe. The one or two times the Army decided it needed to bypass towns and avoid gawkers to stay on schedule, Ostermann was left with the unpleasant task of telling people why the trucks hadn't stopped in their town. The trip had a huge impact upon the future of America's roads. Interstate highway construction exploded in the 1950s, egged on by a man who had, as a young lieutenant colonel, taken one of the most epic road trips in history. If you take a long drive this summer, think about how far — literally and figuratively — we've come since then.